Since the topic of book reviews and Wael Hallaq was being discussed recently, I thought it would be interesting to post a review of Dr. Hallaq on a book published by Colin Imber. 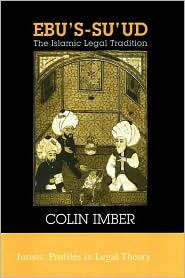 Colin Imber, Ebu ‘s-su’ud: The Islamic Legal Tradition, Stanford: Stanford University Press, 1997. Pp. xii + 288. $49.50 (ISBN 0-8047-2927-1). In the Ottoman legal tradition, Ebu’s-su’ud (c. 1490-1574) is primarily recognized as the jurist who harmonized Hanafite law with Ottoman secular law. It is this significant theme that constitutes the focus of Imber’s brilliant study. But Imber’s analysis goes beyond the limits of this harmonization that fell within the spheres of land tenure and taxation, constitutional law, cash waqfs, and, to some extent, penal law. He also discusses several other legal areas to which Ebu’s-su’ud contributed, situating them, with remarkable competence, in the larger context of classical and pre-Ottoman Hanafite law. These areas include marriage and its dissolution, equality, dowry, maintenance, child custody and guardianship, waqfs property and administration, theft, usurpation, property damage, personal injury, homicide, and criminal liability. Imber’s coverage of all these subjects, together with an excellent biographical account of Ebu’s-su’ud and an introduction to the Ottoman legal context, affords a reasonably comprehensive view of this man’s celebrated legal career. It is therefore quite fitting that the volume is published in the series Jurists: Profiles in Legal Theory, Ebu’s-su’ud taking his rightful place alongside Francis Bacon, Max Weber, and H. L. A. Hart. At-Tahawi Has Moved to its Own Domain! What is the Best English Translation of the Meanings of the Qur’an? Good Lord! These folks are really going at it with one another. Does anyone know of any background to this tiff? I found Mawlana Akram’s edits of specific mistakes to be very typical of a dawra ustadh. Wa’el Hallaq should be humbled by his lack of dhabt in the face of a molvi. At the same time, he seems to have had his feelings hurt by the accusation, to simplify, that he is trying to forward some old school orientalist agenda, which from his rejoinder, doesn’t seem to be the case. I dont think we can assume that just because someone is a Muslim scholar that he necessarily has more “dhabt” than someone who is not. Some academics are very stringent in their own criterion of what they deem to be accuracy. I found Shaykh Akram’s review to be hastily and poorly done, with a ton of assumptions, and his focusing – on occasion – on points of minimal relevance only came back to haunt him. The major thing is that Shaykh Akram’s very premise of characterizing Hallaq’s argument as “old school orientalist agenda” was incorrect, which shows that, as Hallaq himself pointed out, he did not read Hallaq’s works properly. Reading Hallaq’s works, I cant seem to figure out how Shaykh Akram concluded what he did. Either way, humbleness should go both ways, and people should always be open to correction. I would not recommend this book, there is a short refutation of this book in turkish language, the book claims some bad things about shaykhulislam ebusuud.